Bottom line: Now in its fourth generation, Apple's smartwatch is really coming into its own. The wearable finally has direction and purpose with powerful enough hardware to provide a smooth user experience. It's still missing some key features and could always have better battery life but the general consensus seem to be that it's the best smartwatch on the market. Apple’s new batch of iPhones received the lion’s share of attention at last week’s media event but they weren’t the only new hardware on display at the Steve Jobs Theater that day. Cupertino also unveiled the Apple Watch Series 4, a bigger yet thinner version of Apple’s popular smartwatch. Two days out from launch, Apple has lifted the review embargo, allowing early testers to share findings regarding their usage over the past week. Here's what they have to say. We start the round-up with an unboxing and review video from Justine Ezarik from iJustine. Things look different when the screen turns on. The screen on the Series 4 is just incredibly good. Apple says it’s 30 percent bigger, which is one of those specs that’s easy to just sort of pass over when you read it. But 30 percent is a lot, and you absolutely notice it right away. It’s still OLED so the blacks are truly black and blend into the watchface glass. But if you pick a full-screen watchface, you’ll see that the screen also goes closer to the edges of the Watch than before, including the rounded corners. The new watch feels zippier, too; there’s an updated processor. The speaker is considerably louder as well, a benefit when you’re listening to Siri or communicating via the new Walkie-Talkie app that arrived with watchOS 5. The Walkie-Talkie app – each person presses an onscreen button on their respective watch screens to talk – might come in handy when it is better to convey something by voice rather than text. Phone calls are louder, too – though, frankly, I still struggled to hear my wife during a call in my car and struggled as well during another call when I was indoors. Apple also managed to make the new watch thinner than its predecessors. The benefit there is obvious when it comes to making a product designed to be worn on the body. And the slightly larger case size means Apple was able to accomplish this without having an impact on battery life. It’s an interesting choice, given that much of the competition has zeroed in on battery life with recent upgrades, including, notably, the new Galaxy Watch, which Samsung rates at “several days.” With good reason — battery has long been one of the biggest issues with smartwatches. As with earlier versions, Apple rates the Series 4’s battery at “all day,” which certainly lines up with my own testing. Even so, I would happily trade a millimeter or two of thickness for some additional mAhs. As it stands, you should be able to get through a day’s use without worrying about finding a charger, but the peace of mind of more battery life is always welcome. The crown is a useful way to interact with the Watch, rotating to let you scroll up and down lists, pressing in to confirm a selection, for instance. But there's now haptic feedback in the Watch. That's the little vibration which is delicate enough to feel like a gentle press. So, as you wind through a series of elements, like songs in a playlist, for instance, you feel a gentle acknowledgement as each song passes. It's intensely subtle and makes a genuine difference to how intimate and personal the Watch is to use. Listen closely and you can even hear the feedback, sounding like nothing so much as the noise a regular watch makes when it's being wound. Besides health tracking, the watch's new optical heart rate sensor should make a difference in capturing exercise data, which I tested while hiking, running, and lifting. In all instances, it performed comparably to the Series 3—good for most endurance training efforts. Optical heart rate sensors can get tripped up by cold weather and jostling, which I tested by hiking at elevation. The Series 4 captured the workout without issue. On the software side, watchOS 5 continues to refine the watch's UI. Regardless of which Apple Watch you own, you're going to want to update the software. (The latest update is available on the Series 1 and onward.) 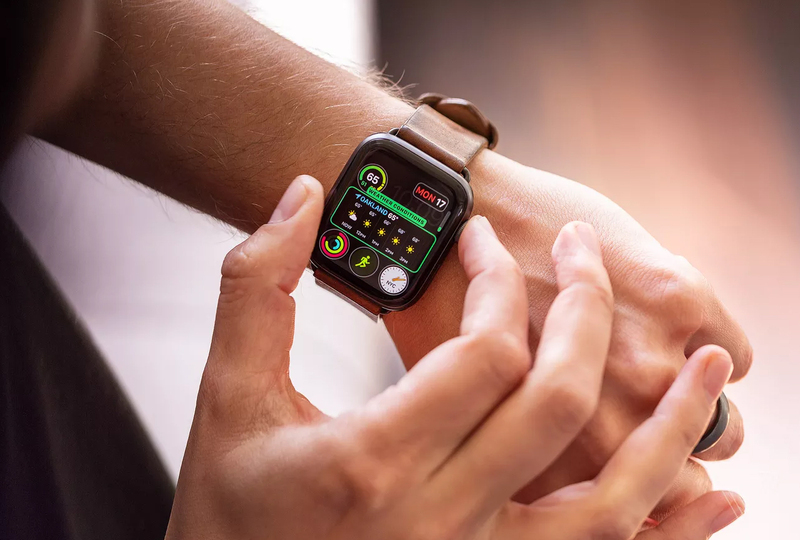 The new software offers grouped notifications, automatic workout detection, podcasts, and a Walkie-Talkie app, all of which make the watch more pleasant to use. I found myself unexpectedly excited for automatic workout detection—if you didn't measure it, did it really happen?—and runners will love the new rolling mile measurement, cadence, and target pace notifications. Apple is now competing with itself, and the Series 4 is leaps ahead again. The hardware is fast enough that no interaction has lag, be it flicking your wrist to turn on the screen, or tapping a complication to launch an app. Eleven years after the release of the iPhone, Apple’s most important product offers only incremental improvements with each new update. This seems to disappoint pundits, who demand giant leaps in technology with every release. But those wanting year over year drastic improvement need only look at the Apple Watch, which shows no signs of slowing down.